The first day of school has come and gone; our leisurely summer schedule quickly erased. That delightful “teacher-parent household management” style we enjoy during the summer replaced by the “dual-employed, high-five as we pass between activities” approach to parenting. As a parent with young kids, I have high expectations for the first day of school. In the scene played out in my mind, we are all up early, dressed and eager to begin the new school year. We sit and enjoy breakfast together, smiles all around! We have time to spare for pictures on the front stoop before skipping to the bus stop, then hugs and waves as my son climbs aboard the school bus. So what if the reality of this vision will occur at 6:30 am – a time when 3/4 of my family had still been in bed during the summer months preceding this big day?! My expected vision failed to play out correctly last year. Our start to 2nd grade must be better!! But no! The first morning of 2nd grade held tears, disappointment, anger – nothing like the vision in my head! Through the summer, we’ve been coping with our son’s physical and emotional response at the sight or smell of food. Nearly every mealtime has been filled with drama; it has been frustrating and exhausting. Concern grew about how and if he would eat breakfast at all. How do I send my kid off to school with no breakfast?! 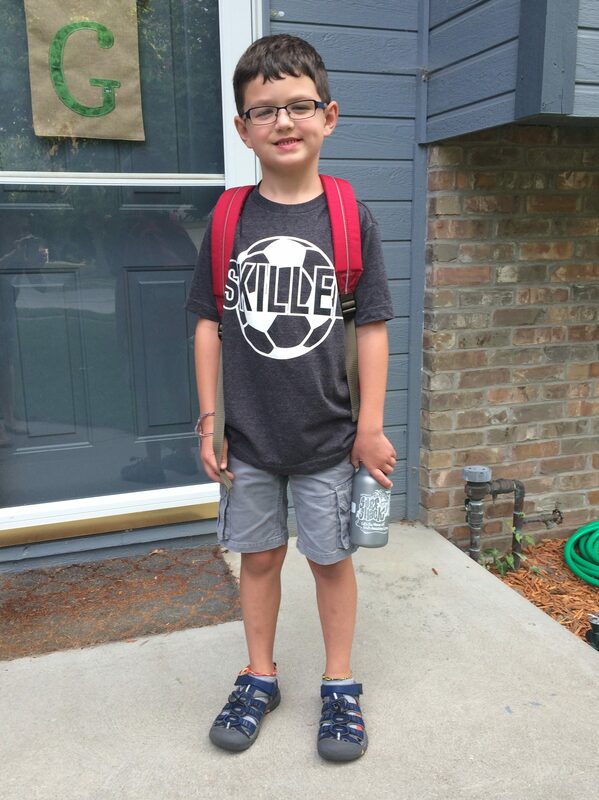 Though progress had been made near the end of summer, the first day of school was a battle of remembering routine, convincing our son to eat, and making it out the door on time. My husband and daughter left, and I remained at home with my 8-year-old. I felt that I had lost the fight, and tried hard to keep my mouth shut, afraid my frustration and short-temper would turn me into “crazy” mom and I’d just start yelling! The sun is bright, the day is warm. My son and I begin our short walk to the bus stop, but my heart is not in it. I really just want to send him on his way and escape. 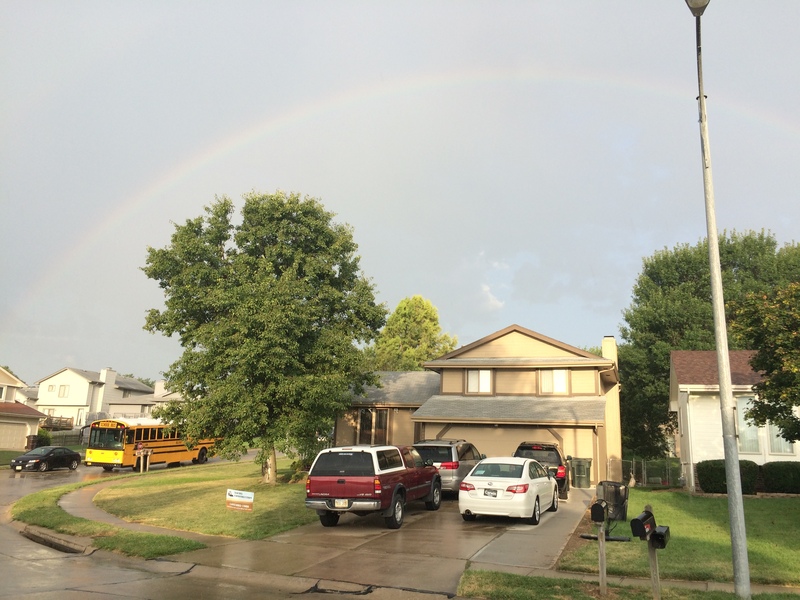 (Not my finest parenting moment…) As we walk, big drops of rain begin to fall, sun still shining brightly, and we spot a full rainbow in the sky to the west. Rainbows are very special in our family – a sign of hope, a reminder of the presence of a God who loves and keeps promises! What a wake up call! Life is not perfect, and the first day of school is no different. If I let something so silly as a frustrating morning before school get me down, how exactly do I expect to cope with life?? The bus drives away and I walk to my car, the rain still falling fast. Then just as quickly as it appeared, the rainbow fades away. My work clothes are soaked through, my hair limp and frizzy, and I’m already late. But I just stand there, look up, let the raindrops fall upon my face and pray: Oh, God! Thank you for the beauty of a rainbow! Thank you for loving us! Thank you for the reminder that even when I’m grumpy and stomping my way through life, YOU ARE THERE – whether I sought your presence or not! Thank you for showing us how to love, how to hope! AMEN! The first day of school was not what I had planned, but in reality it was simply perfect! Categories: Family, God at Work | Tags: faith, God, hope, rainbow, schedules, school, school bus, stress, trust | Permalink.